Results are in for Sports Hall Witney Round 3. A great turnout, well done to…. Henry, Kaiden, Riley, Jamie, Paddy, Tom and Stanley. 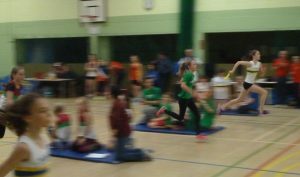 Under 13 girls shaved 0.1 of a second off their Obstacle race record. Well done to Mia, Sarah, Danielle and Freja. Under 13 boys set lots of new records. Burt set new records in the 2 lap and the 6 lap. Thanks to Witney for hosting.